Industrial production in April accelerated by 5.5% YoY. After the March -1.5% YoY decline, this seems like a more favourable print, but the year-on-year number was significantly affected by different working days in both months. While March had two fewer working days than a year earlier, April had two more. After adjusting for calendar effects, April's year on year figure fell slightly and markedly lagged behind market expectations (9%). Still, the weaker than expected result was largely caused by temporary shutdowns in the refining and energy industry. 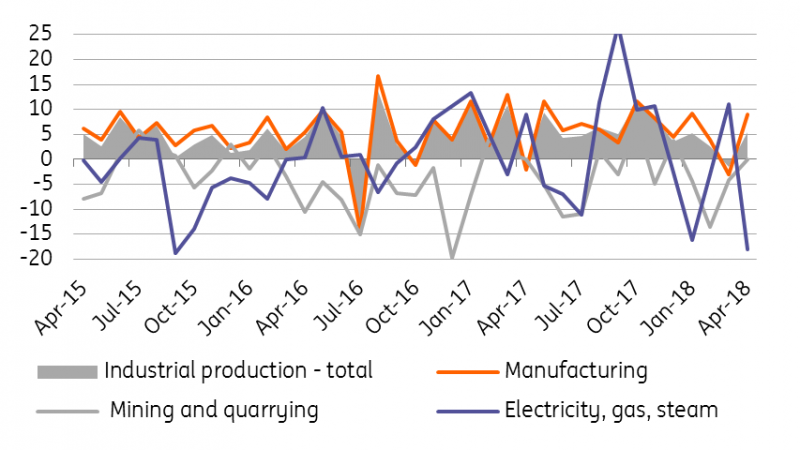 Indeed, shutdowns in the nuclear power plant Dukovany and significantly warmer weather in April this year lead to an almost 20% YoY fall in the production of electricity, which subtracted 2.2ppt from YoY industrial growth. The manufacturing industry accelerated by 9%, though in working-day-adjusted terms the figure was somewhat lower. The car segment itself grew by more than 10%, supported by the calendar bias, but also a somewhat low base from April 2017. In general, however, the production of motor vehicles is stagnating this year after double-digit growth in the last four years. New orders grew only by 0.6% YoY in April, but this was driven mainly by a double-digit fall in new orders in car production, while new orders in a number of other industrial sectors grew above this year's average. April's industrial figures have been affected by a number of one-off effects and the somewhat weaker result should not be overestimated. However, industry is weaker this year, which is related to a high base from last year, the limited capacity of manufacturers and the slowdown in car production. Nevertheless, a number of significant domestic industries remain strong this year and are growing around 5-10%. Due to the slowdown in the automotive industry, we expect industry to slow to around 4% after almost 7% growth in 2017 this year. Still, in the context of manufacturers' limited capacity and the high base of last year, this would still be a positive result.